Game improvement irons are a good mix of forgiveness, distance, feel, and a control as they fall in between super game improvement irons and players irons. 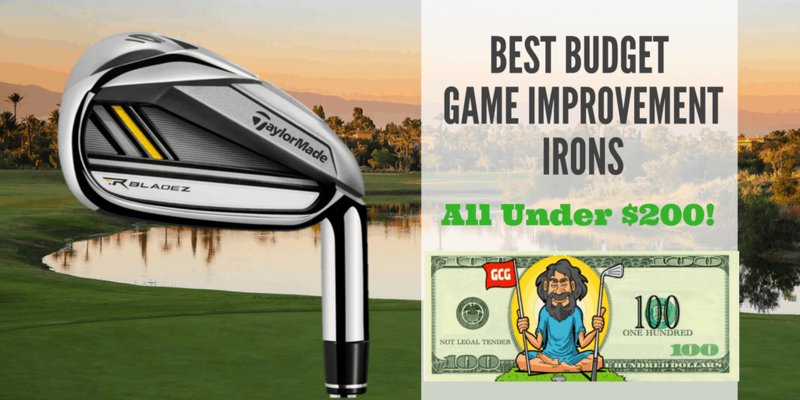 The majority of iron purchases are actually game improvement irons. Here’s the difference that I want to be a part of, though: the average iron purchase at a retail store like Dicks Sporting Goods or PGA Tour Superstore is easily over $500 and upwards of $1000. All of the clubs listed below, on the other hand, can be bought for less than $200 in great condition. So unless you have enough money to buy the latest and greatest irons, you can’t go wrong with any of the 5 options below. To be upfront: all links and pictures will take you to eBay (if you click on them). I’ll get a small commission for anything that you buy on eBay – so thanks in advance!! Man, the TaylorMade RocketBladez iron set made a huge impact on the golf industry when they came first out. The hype from TaylorMade commercials were pretty scammy, but it turns out these irons ended up being a gem of a set. Will they add 47 yards to your old set? No, but you can almost guarantee at LEAST 10 yards depending on what you gamed before. All they did was add in the Speed Pocket for ball speeds, strengthen the lofts a little, and then move the center of gravity back a little resulting in higher launches. These three things paired together resulted in the highest launching, longest iron ever at the time of its release. Aside from the incredible distance that so many mid handicap golfers praise, these irons perform extremely well regarding forgiveness as well. 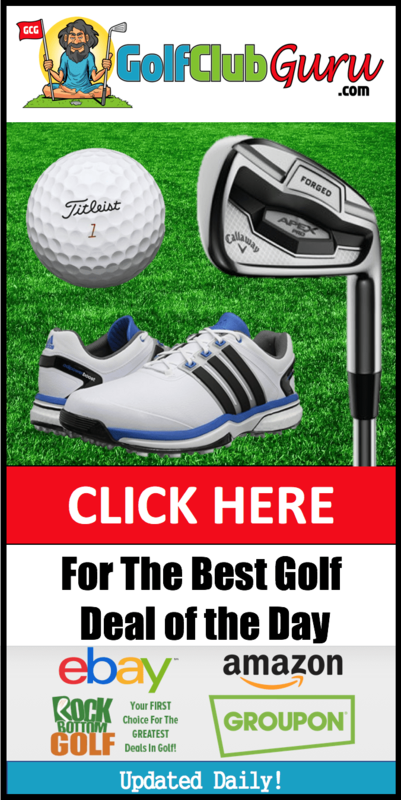 The larger top line and sole greatly improve the results of mishits, but you might give up some distance control on well struck shots in exchange. 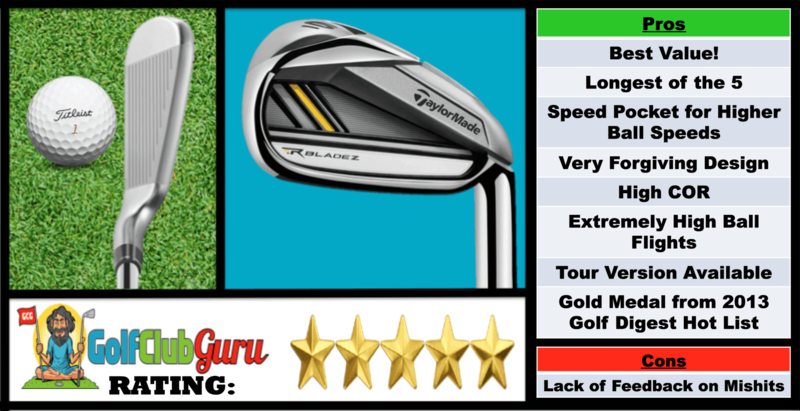 If you are on the borderline of needing game improvement irons or players irons, consider looking into the TaylorMade RocketBladez Pro irons, which features a sleeker design and improved feedback/feel. Thankfully for us, TaylorMade continues to release new iron sets every 3 months, resulting in constantly decreased prices for past models as time goes on. As a result, you can now pick up this set for less than $200 in stellar condition. It would be nearly impossible to talk about the best value game improvement irons without talking about at least one model of the Titleist AP1 family. With the Titleist AP1 712, you will get features such as upgrades from the 710, more forgiveness than the Titleist AP2 712, and the assurance of buying from the most trusted brand in golf. Compared to the AP2, the AP1 is the perfect club for mid to high handicappers, or really anyone that wants to make hitting greens a little easier. The larger club heads and faces result in a wider sweet spot. Mishits still fly pretty long and straight, as opposed to the AP2 where the mishits would end up in trouble. One of the many other benefits of this set is the progressively reduced blade length. Simply put, longer irons are wider and more forgiving, while shorter irons are smaller for accuracy and distance control. Assuming you can get over the dull (not shiny) appearance, you can snag a set of these gems for under $200, as you can see above. 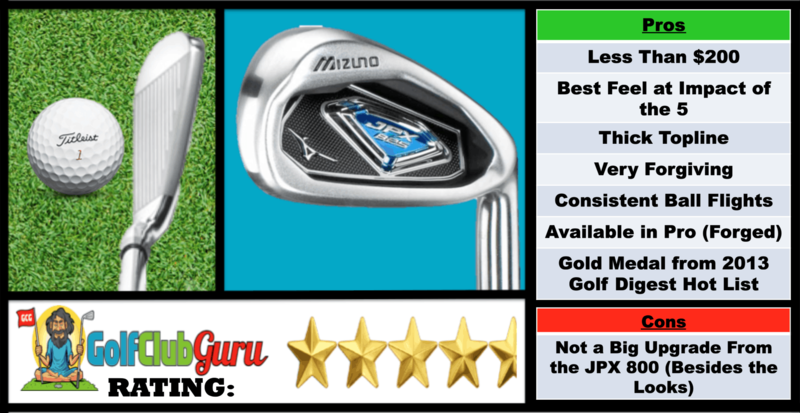 Considering I extensively tested these Mizsuno JPX 825 vs the Mizuno JPX 825 Pro irons, I’d say I have merit in reviewing their performance. First off, the Mizuno JPX 825s feel great! They are very solid at impact. When hit correctly, it feels like you are barely making contact with the ball. Ball flights were very consistent, and the forgiveness was off the roof. I was hitting it off the toe nearly all day, but the balls continued flying straight and far. If you are feeling pretty confident with your ballstriking, consider looking into the Pro/forged version for a little extra money (that’s what I did!). It’s still technically a game improvement iron, but it has a slimmer profile, even better feel, and a little more feedback on mishits. 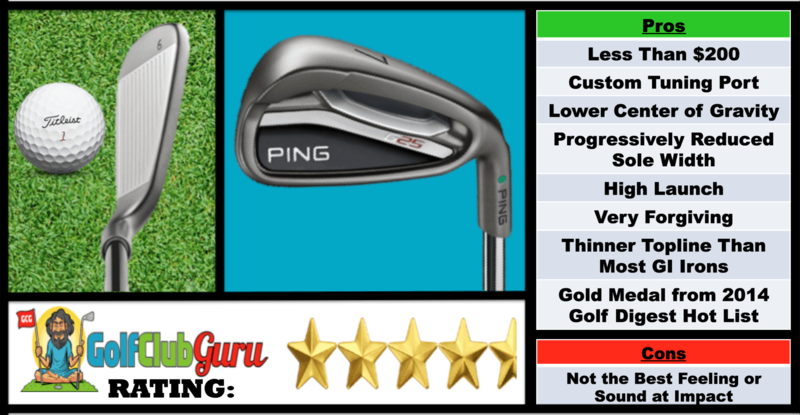 Ping irons are known for their durability and consistency, with the Ping G25 irons being no exception. The custom tuning port in the sole of the club basically just moved the center of gravity lower, resulting in very high ball flights. So if your ball flights balloon already, I would suggest looking at a different set. This set also features progressive sole widths, resulting in more forgiving long irons and more precise short irons. For a game improvement iron, the toplines are pretty thin (sleek profile at address), yet the forgiveness is still top notch! As the picture above suggests, it’s not too difficult to find the Ping G25’s for under 2 hundred dollars. 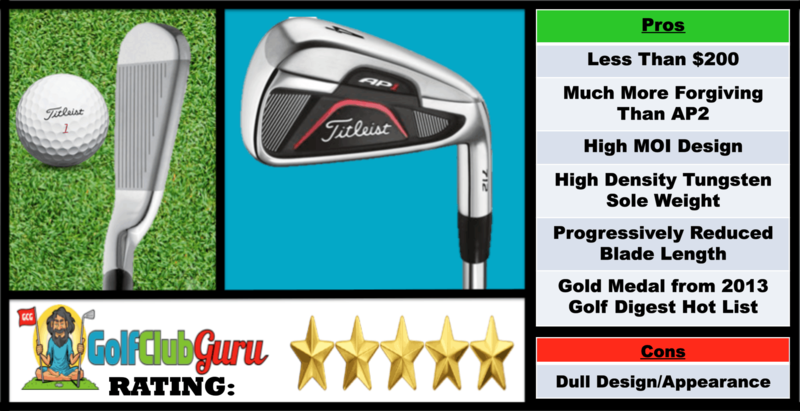 For a club with such great reviews, you can’t go wrong with buying these, especially if you are looking for a set that can last you hundreds and hundreds of rounds of golf. 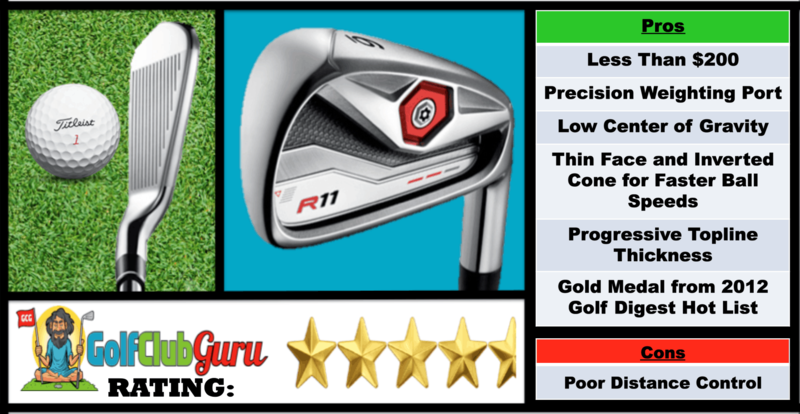 If you are really on a budget and want a cheap set with good value, then the TaylorMade R11 is the set for you! Made famous and recognizable by the red precision weighting port at the sole of the club, the center of gravity is very low. For distance, the thin club face and the inverted cone technology result in improved ball speeds and therefore increased distances. 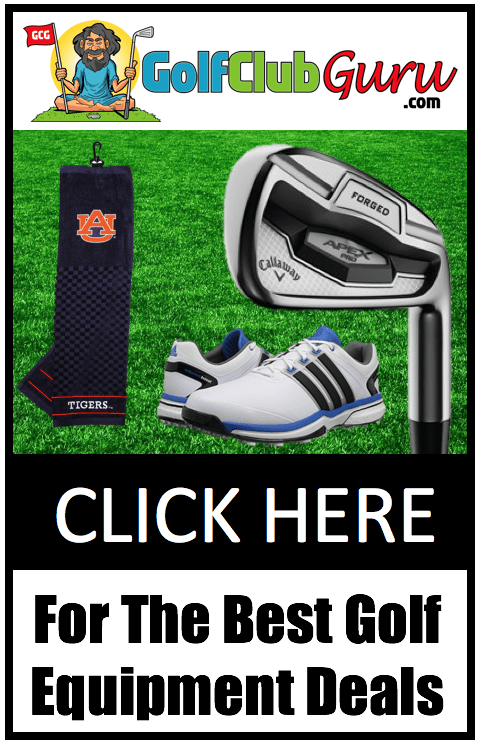 However considering that they are game improvement clubs, you will lose some distance control in exchange for the forgiveness, so keep that in mind. Overall, the R11’s were just a solid release from TaylorMade. Considering that they have made 20 new models since its release, you can now take advantage of extremely low prices on these still incredible performing clubs, often selling for less than $180. As a reminder, when buying on eBay, be patient, add many sets to your “watch list”, triple check every listing, and I guarantee you will find an incredible deal! Great post if any of these were really under $200 anywhere. Your style is so unique compared to other people I’ve read stuff from. Thank you for posting when you’ve got the opportunity, Guess I’ll just book mark this web site. You’ve made some decent points there. I looked on the net for additional information about the issue and found most individuals will go along with your views on this site. Hi, i read your blog occasionally and i own a similar one and i was just curious if you get a lot of spam remarks? If so how do you reduce it, any plugin or anything you can recommend? I get so much lately it’s driving me crazy so any assistance is very much appreciated. just I get that kind of info written in such a perfect approach? I’ve a undertaking that I am simply now working on, and I have been at the look out for such information.